Wall banners are used at airports, retail shops and when exhibiting at a trade show, conference event or for exhibition show design. 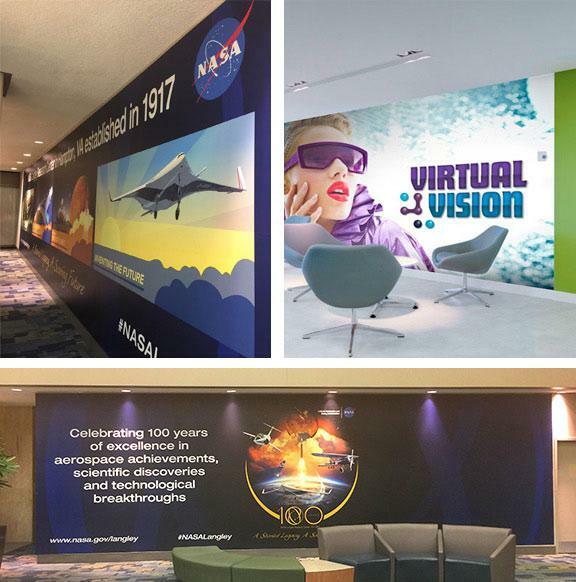 These wall graphics can advertise products or services or even advertisements. Use wall graphics in order to direct potential customers to products on shelves in your store or to direct the flow of traffic at your store or trade show booth. Wall banners are also great as a substitution for wallpaper, whether at a trade show or in your office or store. It can promote your logo and/or company name with ease. When it comes to a trade show presentation, wall banners can be used to provide a dramatic stage backdrop to your particular session. These promotional graphics are created by our expert graphic design team at Capital Exhibits. We can take your vision and make it a reality. We create clear, crisp imagery that conveys your message with ease. Wall banners are an inexpensive way to display your message to the general public, whether at a trade show exhibition booth or in your store/business. Wall banners can be made to be used both indoors and outdoors. For outdoors, you can display them as a way to direct people into your business as a type of outdoor wallpaper. Advertise special promotions, sales events, seasonal offers or hiring information. The sky is the limit when it comes to ideas for wall banners for your Virginia, Maryland or D.C. business. We at Capital Exhibits can help you to create a banner that suits your trade show marketing needs the best. After all, we are experts and have helped countless clients in a variety of industries to generate an ad campaign that works best for your exhibition booth design. Whether for a trade show, conference or exhibition booth, our wall banners provide you a professional approach to your marketing vision. We also offer a wide range of display systems to choose from that accommodate any need, whether indoor or outdoor, as well as vertical, big or table display stands for other graphics. Begin by deciding on a show display design that helps you to create what works best for your company and your advertising goals. Wall banners can be changed throughout the year with ease as they are easy to install and store throughout the year. Perhaps you have certain sales or promotions at different times of the year, create imagery for all of those sales and change your wall banners in your store/business all year long easily with our professional wall banners. Have second copies made to be used at the year’s conference events and trade shows too. Ultimately, Capital Exhibits can offer you high-quality imagery that conveys your message with ease. When it comes to trade show marketing for your next booth show, we can help you create anything you need and want. Our expert team can even suggest other banner solutions to suit the needs of every type of situation. To learn more about our promotional banner design service, contact our expert team at Capital Exhibits today.